2018 was an eventful year, and we would like to take this opportunity to reflect on the work we have done protecting human rights, the rule of law, and the independence of the judiciary. We would also like to look to 2019 and give our members a hint of what we have planned ahead. ICJ Canada was active in responding to pressing issues being faced both within Canada and internationally. ICJ Canada President Professor Errol Mendes has working on the topic of press freedom and the murder of Saudi journalist Jamal Khashaggi. Professor Mendes participated in a news conference with former justice minister Irwin Cotler and several Parliamentarians on November 8th, 2018. Professor Mendes also contributed an Op-ed to the Globe and Mail that you can read here. Members of ICJ Canada also had distinguished years individually. Professor Mendes received a Senate 150th Anniversary Medal in recognition of his work on the rule of law, human rights, and anti-discrimination. ICJ Canada Board Member Pierre Dalphond was appointed as an Independent Senator with the intention of assisting with the Senate's modernization and helping it fulfill its responsibility as a chamber of sober second thought, examination and inquiry. Lastly, ICJ Canada would like to again congratulate Professor Penelope Simons on being selected as the 2018 Tarnoposky Award winner. Professor Simons received the award on October 31st at the reception following the event "70 Years On... is Humanity Ready for a World Court of Human Rights? ", hosted by the Human Rights Research and Education Center and chaired by Professor Packer. 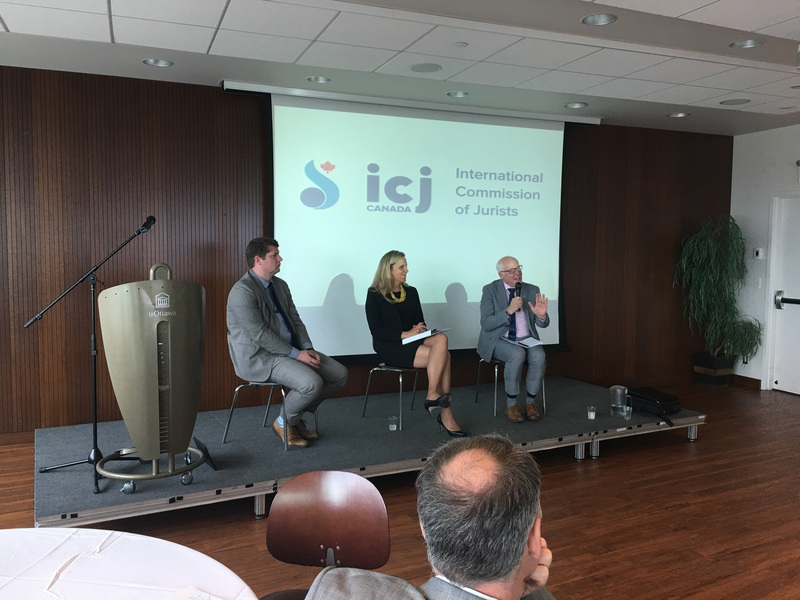 ICJ Canada has several events lined up for early 2019. First, we will be co-hosting a talk with Bill Browder, who will be speaking on how he became President Putin's nemesis with his tireless world-wide campaigning on "The Magnitsky Act". You can see the full details of the event and buy tickets for Bill Browder: From Russia's largest foreign investor to President Putin's Public Enemy No. 1 here now. ICJ Canada relies on the support and expertise of its members to continue its mission of protecting human rights, the rule of law, and the independence of the judiciary. If you have any thoughts on, or would like to contribute to, any of the events identified above, please let us know. Additionally, if you have not already, please consider renewing your ICJ Canada membership for 2019 using the button below. We are looking to expand our membership next year, so if you have any friends or colleagues that would be interesting in supporting assisting us in achieving our mandate please consider suggesting they join us as well. On October 31st, 2018, ICJ Canada recognized Professor Penelope Simons as the 2018 recipient of the Walter S. Tarnopolsky award, which is given annually to an individual who has made a significant contribution to human rights in Canada or abroad. The award ceremony took place in at the University of Ottawa, Faculty of Law's atria at the reception following the event "70 Years On... is Humanity Ready for a World Court of Human Rights? 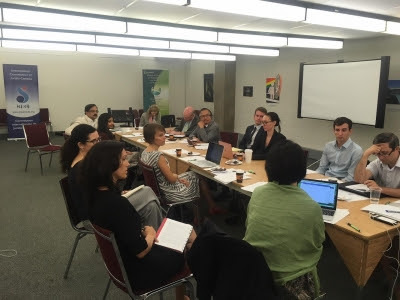 ", hosted by the Human Rights Research and Education Center and chaired by ICJ Canada board member John Packer. Prior to taking up her position at the Faculty of Law at the University of Ottawa, Penelope was a Senior Lecturer in Law at Oxford Brookes University, Oxford, UK. She was called to the British Columbia Bar in 1996 and practiced corporate/commercial law with McCarthy Tétrault LLP. She has also worked in the nongovernmental sector on peace and disarmament issues. Penelope teaches international human rights law, business organizations, public international law and a course on transnational corporations, human rights and international trade and investment law. Her most recent work involved research with UN High Commissioner for Human Right’s Accountability and Remedy Project. In this month which marks the 70 anniversary of the Genocide Convention, and the Universal Declaration of Human Rights, Canada should demonstrate its profound commitment to both Conventions by actions that prevent the promise of “never again” becoming the reality of “yet again” as we are seeing too often, since the Second World War demonstrated most recently by the continuing unfolding of the genocide in Myanmar against the Rohingya people. The International Commission of Jurists, Canada asks the Canadian government to demonstrate leadership by demanding effective international efforts to protect the Rohingya that remain in Myanmar while also ensuring that any attempts to repatriate them back to Myanmar is not sending them back into a continuing form of genocidal repression. This is the minimum that our commitment to the Genocide Convention, the Universal Declaration of Human Rights and our own commitment to the global rule of law demands of us. Today, Canada celebrates the 36th anniversary of the signing of Canada's Charter of Rights and Freedoms. The Charter was signed by then-Prime Minister Pierre Elliot Trudeau and Her Majesty Queen Elizabeth II on April 17, 1982. In 2015, 93 per cent of Canadians surveyed chose the Charter as the most important symbol of national identity, ranking it higher than the flag, the RCMP, the national anthem, hockey, the beaver, and the maple leaf. ICJ Canada President Errol Mendes encourages all Canadians to reflect on the meaning of the Charter’s introduction and how it has shaped Canada since it came into force. 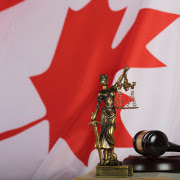 The Charter guarantees basic rights and freedoms for everyone in Canada and continues to be essential in the protection of human rights, the rule of law, and the independence of the judiciary. "Aujourd’hui, j’aimerais rappeler aux Canadiens que nous n’avons pas plus grand devoir que celui de veiller aux libertés des uns et des autres. Les mots enchâssés dans la Charte représentent nos droits, nos libertés et surtout notre responsabilité collective." For more information on the history of the Charter click here and here. For information on the ICJ click here, and for membership information click here. For more information on the Rohingya crisis, see this article by the Guardian, the report by Global Affairs Canada, and the ICC Prosecutors request. For more information about ICJ Canada, view our mandate here. To purchase or renew a membership please visit our membership page. ICJ Canada president and University of Ottawa Law Professor Errol Mendes congratulates the University of Victoria on Canada's first Indigenous Law Degree. 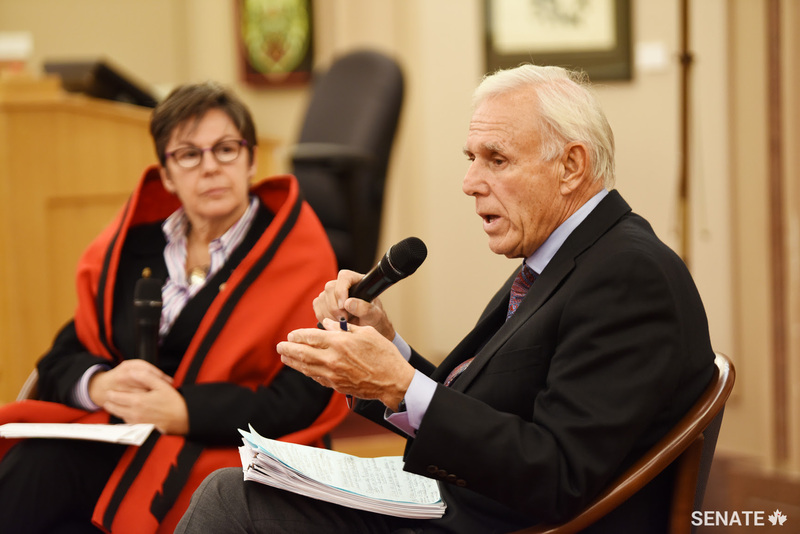 Indigenous and Aboriginal Legal Traditions are gaining traction around the world and we are thrilled to see this development coming from one of Canada's leaders in post-secondary education while promoting Indigenous law and faculty. This aligns with our mandate of promoting human rights and the rule of law throughout Canada and world and aligns with the Truth and Reconciliation's recommendations to increase Indigenous knowledge and teaching methods into classrooms at all levels. 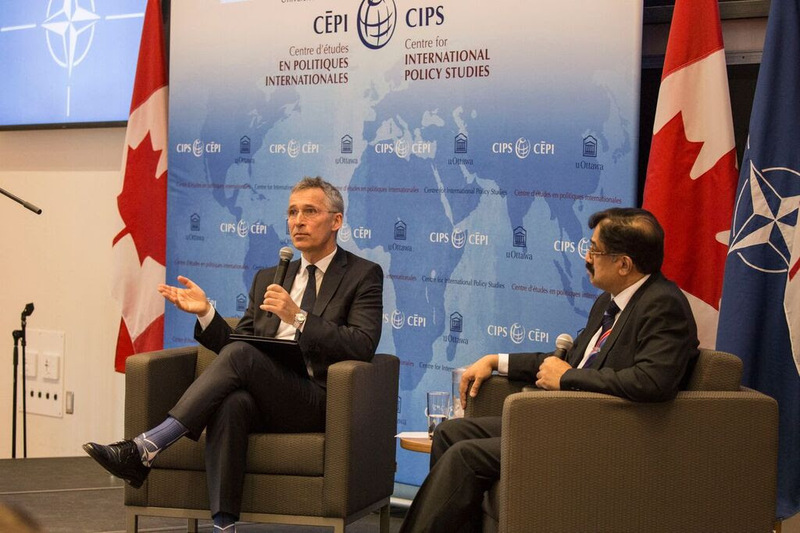 On April 4th, NATO Secretary General Jens Stoltenberg spoke at a CÉPI - CIPS Town Hall discussion on the importance of NATO during a time in which the rules-based international order is being challenged. ICJ Canada President Errol Mendes joined Mr. Stoltenberg on stage as host and discussion moderator.